Pattern/back story: I knit these for a coworker, who has a very, very cold office. The idea is to wear these on top of pants while sitting at her desk, then take them off easily when going home or to a meeting. They are tall and very roomy, so even wide-leg pants would fit beneath without much wrinkling. At the same time, the ribbing keeps them up, the cables cinch them at the ankle, and the garter stitch at the bottom allows the legwarmers to surround the foot and shoe. Stitch motifs, at work! Yarn: Cascade Eco+ in 8462, spruce. I used a little less than 1 skein. I loved knitting with this yarn; it’s not often that I use a bulky weight yarn, and it’s just so awesome how quickly it knits up! So soft, too! And despite such a deeply saturated color, there was just a hint of bleeding when I blocked the fabric. I was expecting much worse. Needles: US 10 circs. The legwarmers are about 18″ tall, and 14″ around, if measured unstretched. If stretched, they are much wider! A great little project to start the year! I will have another FO to show you soon, too, and this one is polar opposite – super delicate lace! They look perfect for what they were made for! Warm and toasty. I love the Cascade Eco yarn – made one of my coziest sweaters with it! It was quick but the gray got tedious on our gray Pacific Northwest Rain Festival days. These are so cool!! Do you have a pattern for them? My floor is so cold here that I could wear these all day long. Plus my niece has a cold office – she would love a pair. Great idea! 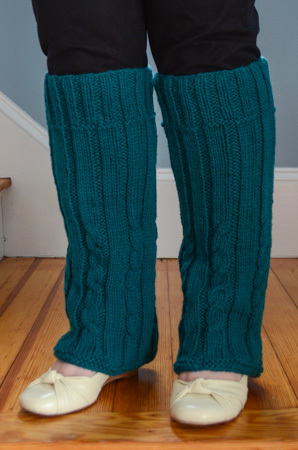 Those look fantastic…Maybe after the Ravellenic games are over I’ll look into knitting myself some legwarmers. Perhaps, wearing wide-legged pants, the legwarmers could be worn underneath? So nice that you are finding time to knit again. I love having an office with an adjustable thermostat; I crank it, even if it means other ladies “of a certain age” fan themselves and look faint when they spend time in my office. I love your legwarmers. Sounds like you thought of everything to make them functional as well as cute.